We bring you some of the most traditional Costa Rican dishes, especially from the southern zone of the country. The food in this part of Costa Rica is well know because of the combination of cultures, for example , “arroz de maíz” (from Guanacaste), Atol (from Panama), Italian pizza, vapor – prepared meat (from Nicaragua) and others. Foods have be categorized according to the cities and places where they are most commonly consumed; however, foods that are prepared and consumed in specific places, are also consumed in other places. Many foods prepared using banana come from the time banana Trade Company was established in the country. As well as banana it is common to find dishes prepared with unripe bamboo. In coto brus where very high quality coffee is produced, it is possible to find many recipes for this product. If you eat in a cafe or restaurant, you will usually be offered another traditional dish called 'Casado'. This dish contains white rice, beans, meat (either chicken, beef or pork served with or without a sauce), a 'picadillo' (finely chopped vegetables such as potato, chayote (a type of squash), banana etc) and a salad (usually green), slices of ripe plantain, cheese, and egg. Express service is also available in cafes and restaurants. Grind ½ kg of pujagua corn (purple corn) and strain using water cook until it gets thick. Separately grind ginger, cinnamon, clavo de olor and strain all the ingredients, then mix all the ingredients and add sugar let the mixture ferment (achichar) as long as you wish. Chopped undraped plantain with meat and tomato peals undraped plantains and choppy them finely, separately chop and onion and fry it with chopped cilantro and ½ kg of grinded meat, then mix all the ingredients and cook them slowly while moving them add some water periodically until the plantain gets soft. Another traditional dish, (which I personally love) is 'Olla de Carne' (literally 'Pot of meat'. This is a soup or stew made with vegetables such as nampi (similar to yucca) , yucca, potato, green banana (banano verde), green plantains and ayote (a kind of squash). The main ingredient of this soup is beef, (on the bone) and it has an exquisite flavor. This is a traditional dish prepared especially during holy week; during this week people try to avoid meat. That is why prepared bizcocho since this is prepared with cheese and corn, bizcocho is a delicious biscuit prepared mixing ½ pound of crushed cheese, 2 ounces of starch,1/2 pound of dough, 2 ounces of butter and salt, then they are baked for one hour. Tamal asado is another delicious traditional food. It is prepared with 1/2kg of dough, ¼ of sugar,1 cup of milk, 2 eggs, tablespoon of butter, 1 tablespoon of fat, ½ cup of fat, ½ cup of slashed cheese a pisk of salt combine all ingredients and beat them well, them pour them into a greased pan and bake. Cut a piece of onion, an unripe (ayote (pumpkin) and a piece of garlic fry everything with 2 ounces of butter and finally add 2 cups of milk. Chop a medium (ayote pumpkin) into small pieces, pour them into a pot, heat them while adding some waters, sugar and cinnamon, cook everything until is ready to eat. It is a tasty coconut dessert, cook rice with enough water then grind the rice, dissolve sugar in the same water rice was cooked, slash a coconut and mix it with ½ kg of sugar, ½ kg of rice, cinnamon, and continue to cook while moving it constantly. The usual breakfast in many homes is 'gallo pinto' which is rice and beans mixed together and cooked in a frying pan. The flavor is different to that of rice and beans eaten separately. In the area of Limon 'gallo pinto' is made with coconut oil and sometimes has Chile Cabro added. These ingredients give this type of gallo pinto a wonderful flavor, and in Limon is known as 'rice and beans'. Normally 'gallo pinto' is served with scrambled egg and onion; this is known as 'Pinto con huevo'. Very traditional in all the Turnos (party for the community) they are those dripped of elote that get ready cutting the grains of corn of the tender "elotes" (corn), those which then are milled until forming a fine and watery mass, to which is added salt and sugar. Those dripped can eat up with bee honey, butter or natilla. Coffee area for tradition, very mountainous, fresh and with a strong Italian accent because the area was colonized for Italian. Dissolve 1,5 spoons of ferment in warm water, after that add a pisk of salt and sugar, pour 1 pound of flour into a bowl, pour the ferment in the center of the flour, add also salt, pepper and 2 ounces of butter, kneed the product, let it ferment for 1,5 hour or 2. Cook corn in water for half-an-hour, grind it finely and prepare dough, you can also add cheese and salt, then put the dough into a hot pan in a small round portions and cook them. This is a dessert made of cooked with milk, sugar, cinnamon, condensed milk and raisins. The tradition (already lost in many places) says that during this week people must not use the stove, so they must prepare different foods before this week stars, that is why people prepare different kinds of candy, bread, picadillos and other non- perishable dishes, people cannot either eat red meat, that is why they prepare many dishes with fish like fish soup, dry fish soup, rice with fish, codfish soup and others. The 'chiverre' is shredded and pan-cooked and then strained through a cloth bag overnight. The next day dulce de tapa (a kind of sweet) is added. The mixture is pan-cooked again to become a delicious sweet treat. Grated coconut cooked with 'dulce de tapa'. Dried and grated ayote cooked with 'dulce de tapa'. Cod fish is added to water to make it less salty. The following day it is cooked in water with vegetables. Some people add coconut milk for a richer flavor. These are made of a corn flour dough and stuffed with rice, carrot, fine beans and beef, pork or chicken, wrapped in banana leaves. The flavor is absolutely delicious. These are bread rolls baked with corn, cheese, sour cream and salt. This is a tamal made with corn, cheese, sugar and sour cream. 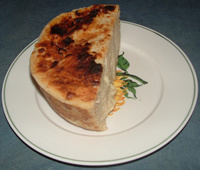 It is pan-cooked first and then baked.